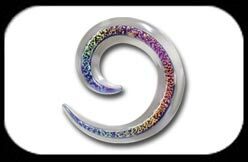 Glass Ear Spirals with Dichroic Rainbow colour, made from Pyrex Glass. Sizes 3 - 6mm. These glass spirals are hand made & no 2 pieces are identical. Exact colour & form will vary bewteen any 2 pieces. SALE!